Indian curries are rapidly becoming my favorite go-to meal. In addition to their ease of preparation (as a one pot meal), healthiness, and general tastiness, they are also endlessly flexible and adaptable to the season. They can be lighter or heartier. They can be luscious with braised meat or vegetarian or even vegan (or anywhere inbetween). They adapt well to any particular produce that can be in season here in Ohio, such as corn, apples, winter squash, greens. When I am without any ideas for dinner, I always start thinking Indian. They do require 2 things. Practice and a pantry. The recipe below may look long and complicated to a novice, but it is much more simple than that. 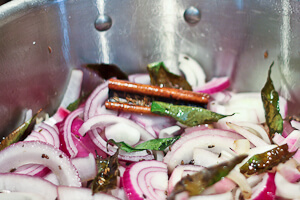 First, you flavor your cooking oil or fat by roasting whole spices (or some herbs, like curry leaves) in the oil. 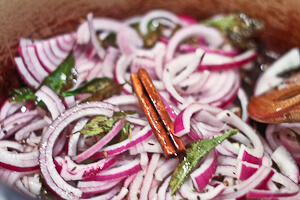 Then, at least for this onion-loving cook, you add tons of onions and brown them well. You consider adding aromatics, such as garlic and ginger, and additional ground spices. If the curry uses tomatoes, I always add them next to cook them down and intensify their flavor. 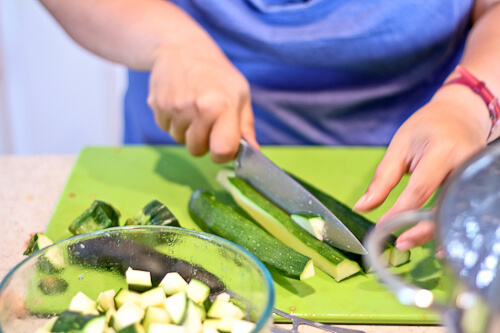 After that, protein and veggies–because I like to make my meals one pot and super healthy, I always adds tons of vegetables, so much of the recipe labor is just basic prep work of different kinds of produce. 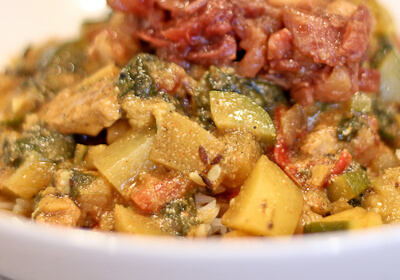 With Indian food, herbs can be added with the veggies or at the end; for example it is not uncommon to find a cup of cilantro cooked into a curry as a green. When the curry is finished cooking, I consider more spices (usually garam masala), a souring agent to brighten the dish (vinegar or citrus juice), maybe some fresh herbs, and potentially dairy. That’s it. But for it to taste Indian, you do need to commit to a good pantry, including lots of different whole and ground spices, seasonally frozen tomatoes when they are not in season, and an assortment of dried legumes. I have been “teaching” my friend Donna to cook recently–in quotes because I am not sure how organized I have been about it. But at any rate, she has been coming over and assisting me with the prep work while we create 2 pots worth of food, and then she takes one home to feed her family. She really enjoys Asian and Indian food, so we have been focusing on curries. One of the more interesting side effects of creating the same dish in 2 separate pots, is that we got a side by side comparison of how the exact same curry cooked in stainless steel (6 qt All Clad) versus enameled cast iron (7 qt Le Creuset). The results were not always as expected. Both pots were mine, and I love both, but the 7 quart round enameled cast iron French oven (basically a Dutch oven) is THE workhorse of my kitchen. I love its heft, its even cooking, its heat retention. So imagine my surprise when I could not deny that the enameled cast iron pot needed more oil and water to prevent scorching of the onions long before the stainless steel. Don’t be afraid to let your veggies thaw in the pot. It saves time and effort, and just adds water and vitamins to the dish. I made this curry deliberately on the mild side, because I was also teaching Donna to make a homemade chutney to go with it. If you don’t have a chutney, I suggest adding more lemon or lime juice, a few handfuls of frozen peas, and maybe a drizzle of honey. Heat the oil in a large, heavy pot, such as a Dutch oven over medium high heat. Add the cinnamon stick and cloves. When the cinnamon stick starts to unfurl, add the mustard seeds and cover the pot with a lid. When the seeds stop popping, add the cumin seeds and stir. 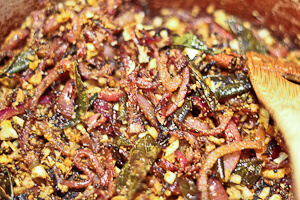 After about 30 seconds, add the curry leaves--be careful, they will spit and sizzle! Give that about 30 seconds and then add the onions with a pinch of salt. Toss occasionally, and let the onions caramelize to a golden brown. Add the garlic and ginger and keep caramelizing. 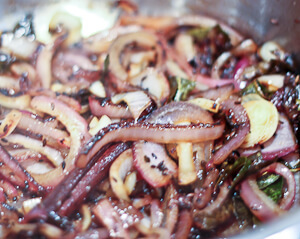 Splash a tablespoon or two of water into the pan if the onions start to scorch or stick. Cook an additional 5 minutes. Add the tomato paste, ground cumin, ground coriander, turmeric, paprika and 1 teaspoon of garam masala. Stir and let roast for 1 minute. Then add the tomatoes with another pinch of salt. Cook on medium high, stirring occasionally, for 10 minutes. When the tomatoes have thickened and deepened, add the chicken and potatoes with several pinches of salt. Toss for 1 minute and add the zucchini and chickpeas with liquid--if the curry needs even more liquid add more stock or water. Bring to a boil, then reduce the heat and let simmer for 10 minutes. Add the spinach--I do not bother defrosting or drying, as that frozen spinach water is just going to add flavor and vitamins to the curry. 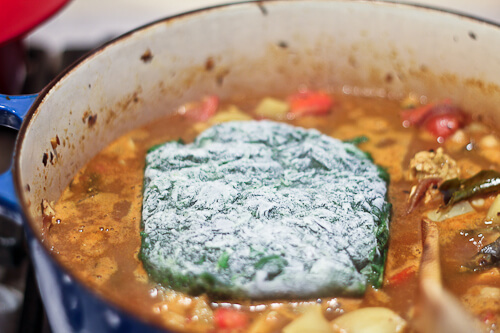 Once the spinach has melted into the curry, add the cilantro, return to a simmer, cover, and let simmer gently for up to an hour before serving. Before serving, whisk 1 cup of the curry into the sour cream or yogurt. When it is warmed through, add it back into the curry. Turn off the heat. Then add 1 tablespoon of garam masala and the lemon/lime juice. Taste for salt, more garam masala or more lemon/lime juice. Serve with Basmati rice or flatbread. I am trying my hand at my first curry dinner tonight. 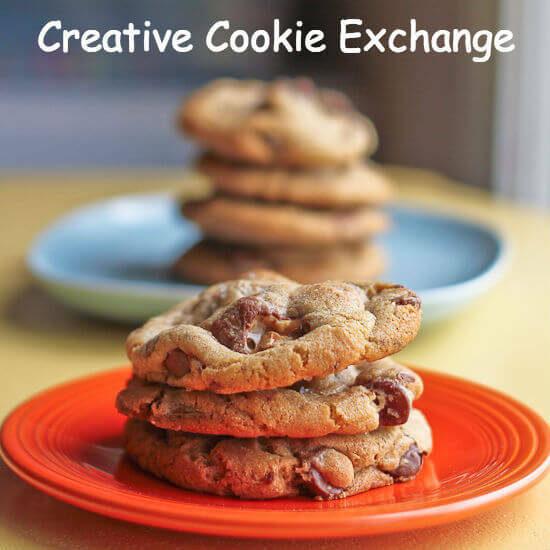 Wish I had of seen your recipe earlier, but maybe next time. Wish me luck. 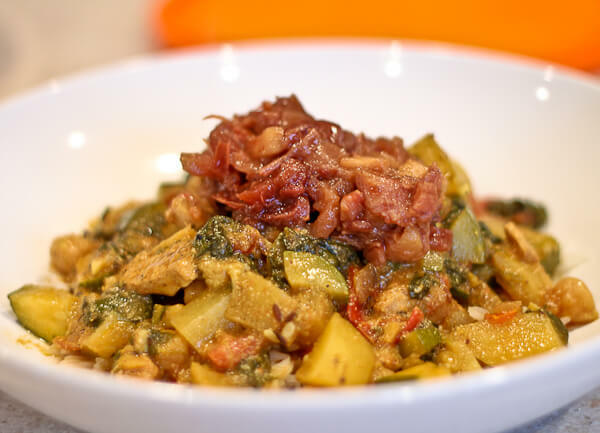 I love curries, does it make sense to add fresh spinach if you have any? i want to eat this, especially with the spinach.